The most symbolic icon of the Victorian Port City is the North Pierhead Lighthouse, located between the 1st Street and 5th Avenue beaches. 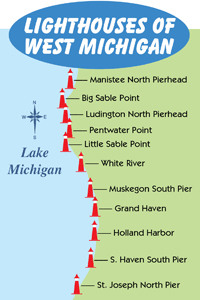 From Highway 31 in Manistee, take Memorial Drive, the first street north of the Manistee River, west towards Lake Michigan. Memorial Drive will become 5th Avenue. Take 5th Avenue to John Red Szymarek Park at the corner of 5th and Monroe. Turn right and follow Monroe to a traffic circle whose center piece is a lighthouse. Go 3/4 of the way around the circle and turn right on Lakeshore Drive. 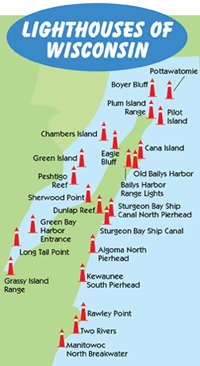 You can either park in the 5th Avenue beach parking lot or continue on a bit and possibly park near the Coast Guard Station, from there you can walk the breakwater to reach the Manistee Lighthouse. First built in 1869, it burned in the Great Fire and a new one was constructed in 1872. 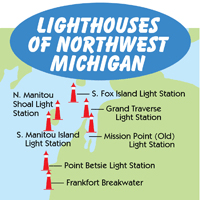 The North Pierhead Lighthouse is built from cast iron and stands 39 feet tall. Many changes have taken place over the years--including a wooden catwalk that was eventually replaced by an iron one around 1900. 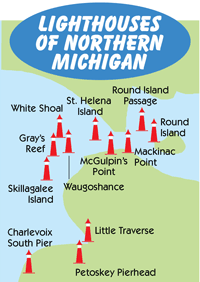 Many Michigan lighthouses demolished their catwalks when the lights became electrified, so Manistee's catwalk is a rare sight. In the late 1920s, after extensive pier renovations, the old fog signal building was replaced by the present structure. 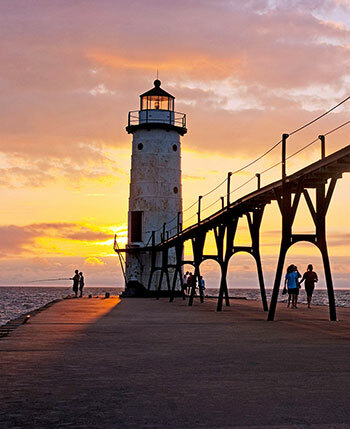 Standing watch over Lake Michigan waters, the North Pierhead Lighthouse welcomes boaters into its harbor, and is a reminder of Manistee's great maritime history.